Money Logging investigates what Gordon Brown has called ìprobably the biggest environmental crime of our timesîóthe massive destruction of the Borneo rainforest by Malaysian loggers. 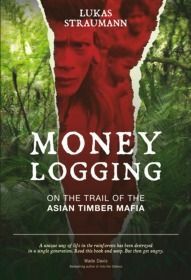 Historian and campaigner Lukas Straumann goes in search not only of the lost forests and the people who used to call them home, but also the network of criminals who have earned billions through illegal timber sales and corruption. Straumann singles out Abdul Taib Mahmud, current governor of the Malaysian state of Sarawak, as the kingpin of this Asian timber mafia, while he shows that Taibís familyówith the complicity of global financial institutionsó have profited to the tune of 15 billion US dollars. Money Logging is a story of a people who have lost their ancient paradise to a wasteland of oil palm plantations, pollution, and corruptionóand how they hope to take it back.